Faced with an export ban on five vegetable products starting in 2015 and increasing rejections of fresh fruit and vegetable shipments to the European Union, Ghana set a goal: meet internationally recognized food safety standards so that Ghanaian products can compete in international markets. One of the major challenges facing Ghana was the inability to effectively trace products from the field all the way to the point of export. Farmers learn how to use the traceability system using mobile apps. with decisive action when problems arise. To support Ghana in meeting its goal, USAID’s Improving Food Safety Systems Project (IFSSP) targets traceability to ensure food safety and to build confidence in Ghana’s export products. IFSSP has successfully developed a traceability solution to ensure compliance with EU and other international food safety regulations. The system works to track produce from seed all the way to point of export, including Kotoka International Airport in Accra, where most shipments to the EU depart. IFSSP presented the system to EU auditors when they visied Ghana in September 2017 to review measures taken to lift the export ban. The presentation of the system was one of the factors that contributed to the lifting of the ban in January 2018, allowing Ghana to increase exports to the EU. 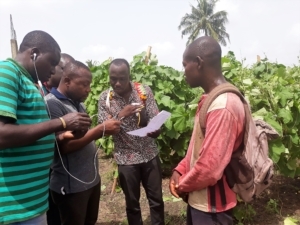 IFSSP has also trained inspectors, such as officers of Ghana’s Plant Protection and Regulatory Services Directorate of the Ministry of Food and Agriculture, exporters and farmers in the importance of proper record keeping and tracking products and the use of the new traceability technology. On February 14, 2018, IFSSP officially launched the pilot of the traceability system with a stakeholder forum. This event included officials from USAID, the Ghanaian Ministry of Farming and Agriculture, and representatives from export associations. In keynote remarks, Ghana’s Deputy Minister for Food and Agriculture in charge of Horticulture, Mr. George Oduro, stated that, “(t)he development of the traceability system was critical to the lifting of the EU ban.” Minister Oduro shared his appreciation for the work of USAID/IFSSP. As the highpoint of the event, the stakeholders and forum attendees fully engaged in a demonstration of the traceability system. Since the launch of the traceability pilot, the system has already begun to demonstrate results. Within a month, two of the exporters piloting the system, Joekopan Farms and AT Mahli Farms, traced their produce shipments farm to port by creating compliant and unique product identifications and generating tracking reports. Both companies then exported their first tracked products to the EU since the lifting of the export ban. A third exporter, AT Trotsky Farms, expressed confidence that the system would allow them to export to the EU as well as help them keep track of problems in their fields. “We have just started using traceability with tuleria, which will allow us to export to European Union, and it allows us to keep track of problems in our growing facilities as well,” noted Sampson Vorsah, manager of AT Trotsky. Ensuring that Ghana has a globally recognized platform for traceability builds confidence across international markets that Ghanaian horticulture is compliant with international standards and is safe for consumers. Ghana’s farmers and exporters can build up their export businesses with the confidence that their products will not be constrained by other non-compliant actors in the market. Now bad produce can be tracked directly to the source of the problem and contained. The three-year EU export ban cost Ghanaian farmers approximately $30 million in lost revenue. IFSSP and the exporters participating in the pilot are confident that such a ban will not be reinstated and that Ghanaian farmers will be able to increase their access to markets and increase income with the use of the traceability system. The John Ogonowski and Doug Bereuter Farmer-to-Farmer Program (F2F) provides technical assistance from U.S. volunteers to farmers, farm groups, agribusinesses and other agriculture sector institutions in developing and transitional countries with the goal of promoting sustainable improvements in food security and agricultural processing, production and marketing.